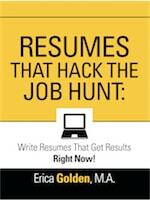 RESUMES THAT HACK THE JOB HUNT: Write Resumes That Get Results Right Now! by Erica Golden, M.A. A three-step guide to writing resumes that get real results in today's job market, from an expert career coach, experienced HR professional and recruiter who has helped 5,000+ clients make career transitions in the modern workplace. We all know the pains of resume writing. Just the thought of crafting a resume is stressful enough to stop a job hunt before it starts! The process can be crippling: What do you say to make your resume stand out? How can you know what employers are looking for? Is the resume you wrote years ago still relevant? Erica's method works because she's seen how hiring happens from every angle. She's been on both sides of the interview desk. She's done the hiring, and she's done the firing. Through it all, she's learned how hiring really happens today. In Resumes that Hack the Job Hunt she reveals the trade secrets that few people can share outside HR offices, recruiting firms, or college career centers. Use her three-step system for a ready-to-go resume! Erica Golden, M.A., C.C.C. is an Executive Coach, Career Consultant, and Co-founder of the Institute for Career Coaching and Development. 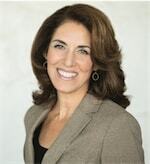 Erica’s background includes 15+ years of experience in career consulting and human resources at Silicon Valley start-ups, global enterprises, and F100 firms. She's coached over 5,000 job seekers in effective career transition for today’s changing workplace. She holds a M.A. in Career Development from J.F.K.U. School of Management, B.A. in Psychology from U.C.S.C, and is a Certified Career Coach.